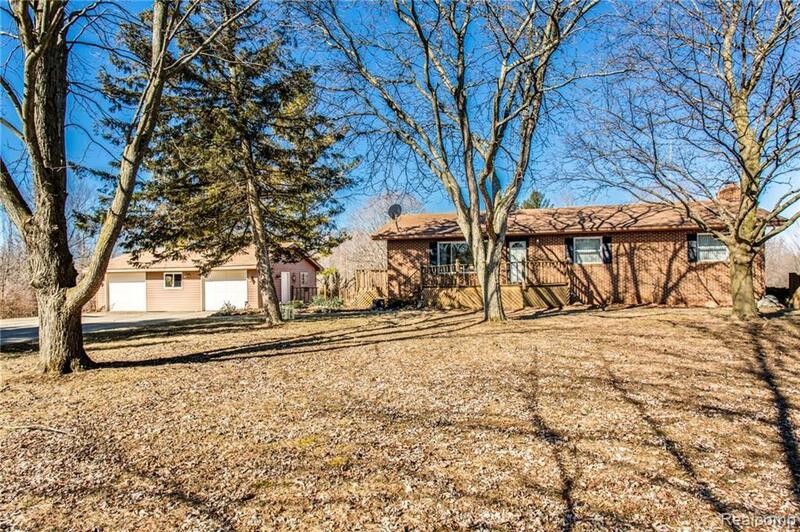 Fantastic ranch style home located on 10 Acres. Home features eat-in kitchen area with pantry and main floor laundry. Appliances include stove, micro, fridge, and new dishwasher. There is a full wraparound deck leading from the side entry porch all the way around the back of the home with a slider door off of the dining room and master bedroom for peaceful enjoyment. The finished lower level includes a 4th bedroom with full bath, natural fireplace, custom built ins, detached sauna, 8.5 foot ceilings, open concept with walkout leading unto a deck for outside entertaining. This outside includes brick paver sidewalks and stairs leading to the lower level deck and backyard. The garage has newer shingles in 2017, with 220 power and gas generator for full home. The pole barn has 220 power with separate workshop and partial concrete floor. This 10 acre partially wooded property has a beautiful 80x180 pond approx. 10 ft deep. Included is a one year home warranty.